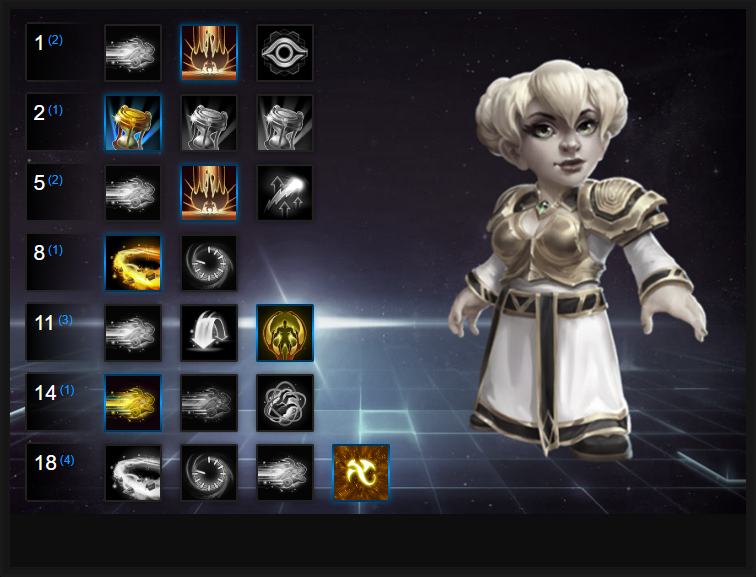 In this Chromie Build Guide, we provide an overview of her strengths, abilities and talents. Chromie is a ranged, artillery based mage that deals massive damage from afar. In a similar vein to Li Ming, she is very much about positioning and utilizing her extra range over other Heroes. Unlike Li Ming however, she brings some utility and a powerful Trait that allows her to access her talents two levels early. She has two Heroic abilities that are flexible, with both bringing nuisance and zoning potential. I will add that Chromie is surprisingly powerful due to her ability to protect specific points with her Time Trap, but to also deal surprise attacks thanks to Dragon's Breath. On objective heavy Battlegrounds, Chromie excels at poking players down and if she does land her shots with accuracy, can blow players up incredibly quickly. A well played Chromie is tough to deal with if she constantly stays at maximum range. Time Walker (Trait) - Providing Chromie with every talent 2 levels earlier than her teammates, Timewalker is pretty incredible. Considering at level 8 you'll be able to drop your Heroic ability, or at 18 use your Storm Talent, it's exceptional. Best of all, you don't have to do anything to make use of it. Sand Blast (Q) - Sand Blast is a long range artillary shot that allows Chromie to fire a sand projectile at her foes. It will pass through all minions until it hits an enemy Hero, meaning it cannot be used for wave clear. It deals huge damage but because of that, has a slight delay just before casting. Taking this into account can be difficult, especially against a moving target. As such, it's best to use Sand Blast outside of an enemies vision so they won't expect the attack. After casting Sand Blast, Chromie will leave a replica of herself behind, which also casts Sand Blast when she does. Dragon's Breath (W) - A unique ability that deals high impact damage across three projectiles. The fact enemies can only see where the Dragon's Breath will land just before it hits, makes it incredibly strong, not just for sneaking up on enemies or for ganking from afar, but because it allows Chromie to remain unpredictable. As always, try to use this on the priority targets and be sure to follow up immediately with a Sand Blast after using Dragon's Breath. With practice you can land them instantly. Time Trap (E) - Chromie's only means of defence, Time Trap allows her to place a sand timer at a location that will stealth and cause stasis to anyone near it, once she detonates it. It's primarily used for escaping, defending your lane (to prevent you being ganked) or to make a nuisance of yourself when the enemy team are trying to attack an objective. Placing the Time Trap in locations players are mostly likely to run into it can allow you and your team to burst them down once they come out of stasis. Slowing Sands (R) - The "quieter" of her two heroic abilities, Slowing Sands is an AOE slow that lasts as long as Chromie has mana. After 3 seconds it will slow by 70% - a huge amount and one enemies can't dispell. Used on or before an objective it can allow Chromie to not only trap enemies (placing a Time Trap on the other side of the Slowing Sands works well) but to also allow her team to deal damage to those in it. Temporal Loop (R) - After 3 seconds Temporal Loop will teleport the affected enemy back to where they were when it was originally cast. It effectively turns back time for one player. As you might expect, this is particularly useful for two scenarios: preventing escape or ensuring survival. If an enemy player is escaping, casting Temporal Loop on them will bring them back into a fight. Alternatively, if an enemy is trying to kill you, casting Temporal Loop on them will magic them back to where they were - creating a large gap between you and them. There's also some clever tricks you can play with Temporal Loop as if you can remember where an enemy was when first cast, you can line up a Sand Blast and Dragon's Breath for the moment they reappear, just be sure to cast both abilities when the clock is past the half-way mark. Deep Breathing allows Chromie to improve Dragon's Breath, allowing her to boost its damage by a total of 100, while also providing her with increased vision radius after she completes her quest. After Time Trap ends, those caught in it suffer Chronic Conditions, and are slowed by 25% for 3 seconds. For landing shots, and frustrating opponents, it's amazing. Mobius Loop lets Chromie reduce the cooldown of Dragon's Breath by 1.5 seconds for each Hero she hits. It also restores 40 mana. If you can land your 3 attacks against multiple foes, the uptime on your highest damage ability is significant. On Objective heavy maps that require interaction (such as Towers of Doom) Slowing Sands can be extremely useful. Placed in a choke-point leading to the objective, or very near to it, can ensure your team has an advantage. It also means anyone caught in it is easily hit by Chromie's attacks, and that's never a bad thing. Variable: Chromie has only one means of defence and that's a static object that needs to be armed. Temporal Loop can not only ensure her survivability against any Hero it's cast on (it'll move them away from her once they've ran in her direction) but can also be used aggressively to prevent enemy players escaping. Best of all, with practice it can allow Chromie to set up perfect spikes - just aim your shots where the enemy first started. With few means of defence if Time Trap isn't available, Time Out allows Chromie to put herself in stasis for 7 seconds. This can buy you a huge amount of time for your team to come to your rescue. Best of all, it allows Chromie to prevent damage to herself, or actions against her (such as a throw or pull). Shifting Sands allows Chromie to significantly increase her ability damage every time she lands Sand Blast. With her damage increasing by a maximum of 40%, the boost can be refreshed repeatedly. Obviously you need to remain accurate, but that's fairly easy for experience Chromie players. Variable: Increasing Chromie's ability power by 25% for 10 seconds, Quantum Overdrive allows her to deal amazing burst damage - especially if you have Timewalker's Pursuit maxed (bringing the total to 30%). Just be sure to land your shots when it's active. At level 18, Blessing of the Bronze lets Chromie and all her team move 10% faster, while reducing her basic ability cooldowns by 30%. It's pretty amazing for bombarding enemies. This list of tips and tricks are just a handful of things we think will help your Chromie play. We'll continue to add to the list as required and if you have any tips you'd like to share, let us know in the comments below and we'll place them here. 1. Chromie has ridiculously long range - make use of this in teams fights and to siege against enemy structures. 2. Your cooldown on Sand Blast is very low. Be sure to constantly release them in a team fight. 3. Sand Blast can only affect enemy Heroes - you can't use it for wave clear. 4. Due to the casting delay on Sand Blast, it's possible to quickly cast Dragon's Breath, followed by Sand Blast, for a huge single location burst of damage. 5. Your Time Trap's should always be placed in locations most walked. It's primarily a defensive tool so be sure to use it in lane or on Objectives. 6. Dragon's Breath has a delayed impact warning. This makes life very difficult for the enemy team and their healer as they won't know where you've fired it before it's too late. 7. Temporal Loop should be used against high priority targets that are likely to try and escape you and your team (healers/mages). Be sure to use it on them just as they're running so they're brought back to your team. 8. If you're being dived on by a melee assassin, use Temporal Loop and keep running. It'll create huge space for you. 9. Against a melee heavy composition (or assassin heavy) Time Out can be invaluable. Use it when they dive you to buy you space. 10. Always try to destroy the enemy teams Fountains with your skills. You can poke most of them by attacking from the sides of the keep. 11. Try to always fire your skills from maximum range and from cover (bushes/vents) - the element of surprise is key for Chromie.